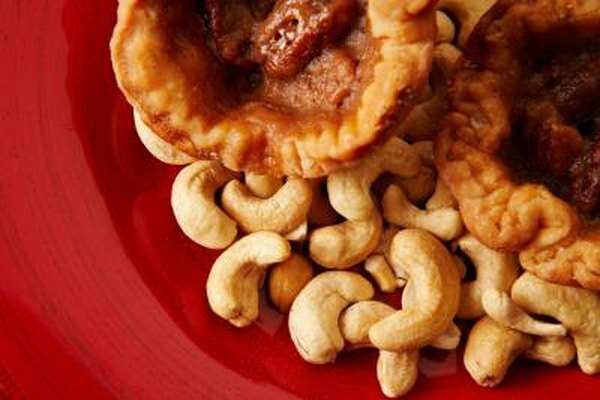 Which Nuts Contain Good Cholesterol? Does Eating Eggs Increase Cholesterol? Are Avocados High in Omega-3? While the body needs cholesterol in the blood to build healthy cells, a build-up of the waxy substance found in the lipids, or fats, in the blood can lead to heart disease. Excessive cholesterol stifles blood flow through the arteries. When insufficient blood flows to your heart, you can have a heart attack. Low blood flow to the brain also precedes a stroke. Diet and lifestyle choices contribute to high cholesterol levels. Nuts can play an important role in reducing those unhealthy cholesterol levels. Cholesterol attaches to proteins in the blood and forms lipoproteins. LDL, or low-density lipoprotein, makes up the "bad" cholesterol levels that build up in the artery walls, leaving them too narrow for blood to flow through. High-density lipoprotein, commonly referred to as HDL, forms the "good" cholesterol that carries excessive cholesterol out of the body through the liver. Cashews and other nuts do not bring any cholesterol to the body but can help to increase HDL levels. Cashews do not have any cholesterol in them. They are however, high in fat. The fat in cashews and other nuts may help to produce the good HDL that can prevent heart disease and associated clogged arteries. A diet rich in healthy fats and fiber, such as those found in whole grains, cashews and other nuts, may help to reduce LDL and increase HDL in the blood nearly as much as some cholesterol-lowering medications. Dietary cholesterol should be limited to less than 300 milligrams per day. People with existing heart disease should limit dietary cholesterol to less than 200 milligrams per day. Food labels typically report the amount of cholesterol in each serving. Foods that contain the highest concentration of dietary cholesterol include whole dairy products, eggs and fatty cuts of meat. While healthy in many respects, cashews do contain saturated fats and are high in calories, which is especially important to keep in mind if you are trying to lose weight. One ounce of cashews has about 170 calories, 12 grams of fat, of which 2 grams are saturated fats that can add weight and increase cholesterol levels. One ounce of cashews, the typical serving size on packages, translates to about 1/16 cup. Cashews contain fatty acids that can help to reduce the risks of heart disease. The fat ratio in cashews is one part saturated fat, two parts monosaturated and one part polyunsaturated, a healthy ratio for increasing HDL cholesterol levels. Cashews also help maintain heart health because they are high in magnesium, zinc, iron and copper, nutrients that work as antioxidants to clear free radicals from the blood stream. Can Flaxseed Help Me Lose Weight? What Are the Benefits of Raw Peanuts?